Homesickness changes with time. It turns from the sharp attacks that hit you unexpectedly at the beginning of your first journey away from home to small bittersweet moments that fill your heart with a combination of longing and satisfaction: you embrace your memories and the part of home that stays inside you, even as you enjoy your current situation. I used to associate homesickness with missing the people back home, but about ten days ago, in a dimly lit café, while I listened to the rhythmic sounds of Arabic poetry, I realized what home actually meant to me. 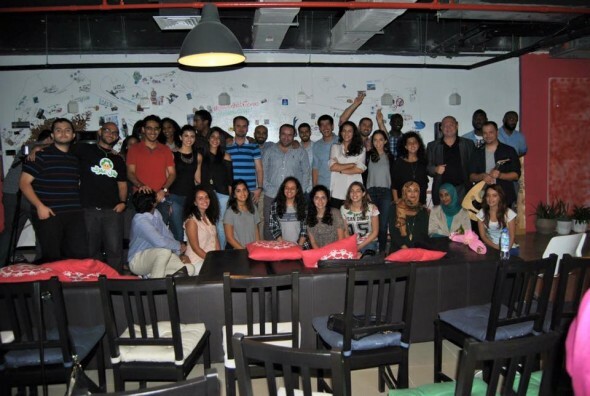 It took the rhythms of Rooftop Rhythms Arabia at Brand Moxie to remind me that home can be a feeling, as well as a place. On that very humid Wednesday evening, I went along with a bunch of students from NYUAD to Brand Moxie in Rotana Complex. 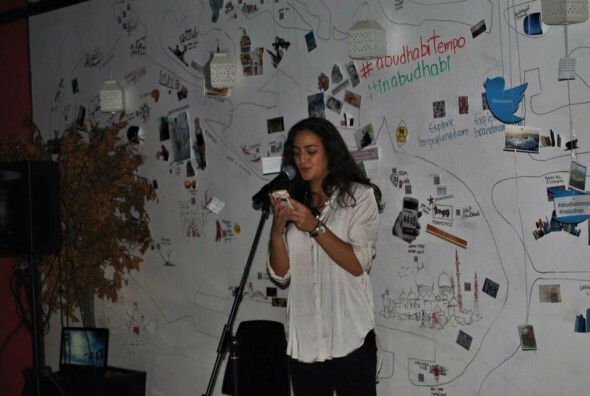 The Arab Cultural Club promoted the event; the group consisted mostly of Arab students and students studying Arabic, but some came merely because they enjoyed hearing poetry regardless of whether they understood the words or not. I think that that is what makes poetry art: the ability to enjoy it without fully understanding it. The beauty in that is that you can still get the purpose behind the piece of poetry from the dancing voices of the poets performing. The place was very artistic, with abstract paintings and colorful pictures spread randomly on the walls, reminding me of the cafes my friends and I would go to back home. We used to sink into sofas and talk for hours. Arabic calligraphy decorated the walls of the poetry space, bringing back images of my school’s hallways, which were filled with the students’ admirable attempts at calligraphy. At the back, the space looked like an art studio, but it also had bookshelves that would bring any bookworm to tears. The cozy atmosphere triggered memories of cold winter nights when I would sit in the living room of my house, sipping hot drinks and watching the wind occupy the night. I couldn’t understand how these waves of memories came to me when it’s 38 degrees outside, but it did. Listening to the poetry, however, was a whole other chapter of nostalgia. I sat in the front row, and watched the people in the audience, which was quite diverse. Most of the audience consisted of Arabs from different nationalities and different age groups. They all seemed tired after a long working day and seemed a bit annoyed with the fact that we, the proud NYUAD students, took over all the comfortable couches. People from other nationalities streamed in as well. My favorite person that night was the organizer of the event, Paul Dorian, who despite not understanding one word of Arabic, roamed the room with contagious enthusiasm. The evening started off with a piece by Farah Shamma, a young Palestinian poet with a talent and a spark that far exceeds her age. 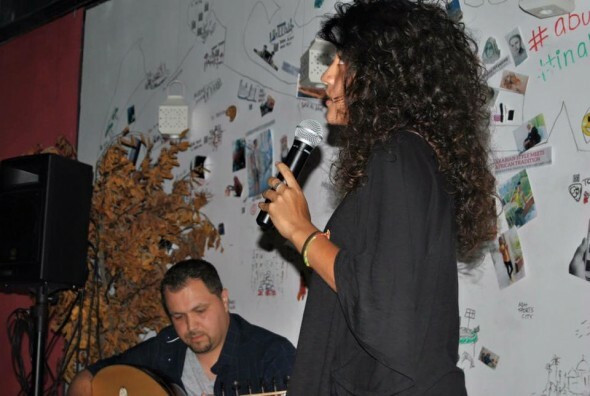 She is the one who popularized the art of spoken word to Arabic poetry. Her poem was about language and its connection to home. She talked about the challenges the Arabic language is facing with the Arab world turning to the usage of English in education and business. Her words were quite personal, and she recited the poem in both English and Arabic. One of the most exciting parts of the poem was when she recited the Arabic alphabet, her voice reaching a higher pitch with each letter, and suddenly switched to the English alphabet at the end. The audience laughed for a split second, and then fell into deep silence after realizing the deeper meaning. The switch between languages was dramatic, emphasizing the confusion between words and themes that occurs in the transition. She talked about the warmth she feels when she uses her native language. Listening to her took me back to the long discussions we used to have in my school about language and its role in defining our identities. In one of the hallways at school, an Arabic teacher had hung a poster displaying the famous quote “I am my language”, written by the Palestinian poet, Mahmoud Darwish. Other performers followed, each pouring the contents of their hearts to the sympathizing faces of strangers. Some talked about loneliness, others about God, and others described their homesickness. The most touching performance was by a Syrian engineering student, who dreamed of becoming a theatre major but the idea of a ‘safe career’ discouraged him from pursuing that dream. He recited a short poem about a woman he loves passionately. He reminded me of what I miss about writing in Arabic: the strength you could find in the words. There are around 38 words to say love, for instance, ranging from platonic love to obsession (not good, but it’s still love). His words were powerful and tender, and with a talented musician playing the oud in the background, his performance was touching beyond the barriers of language. It was art. He ended it with a thud, saying how the two lovers, referring to himself and his loved one, were separated by religion. The mere idea of a poetry night itself reminded me of the poetry competitions we held at school, the literature evenings, and the book discussions we were forced to attend but learned to love at the end. I felt it then, the pinching feeling of wanting to return home for just a few hours, and embrace that feeling of unity and love that art used to create in those days. I realized that my school used to be a home to me in more ways than one. I was practically raised there. Because my mom is such a dedicated teacher, she rolled me up in a blanket when I was only 40 days old and took me with her to school. She would leave me in the nursery while she ran from a classroom to another, taking breaks every so often to tend to me. The school instantly became home to me. It had all of the components of home: my mother and sisters, to begin with, and most importantly the artistic and open view of the world. We were immersed in all kinds of art, and my personal interest drove me towards language. I saw how beautiful words could be, whether it’s in reading literature, reciting poetry, or turning the offspring of my imagination into words. The love I had and still have for language made me feel safe. As cheesy as this may sound, I used to bury myself in language, usually by writing, whenever I needed an escape. My school nurtured language, my safe haven, and became a home to me. I studied there for 18 years, and now I realize that after I graduated, the school had a permanent place in my heart. Poetry was a big part of what I call home, which I didn’t realize until I visited the home of Rooftop Rhythms.